I had to make a dessert for a church pot luck dinner, and as usual I had a few verging-on-overripe bananas on the counter. What to make with those bananas? 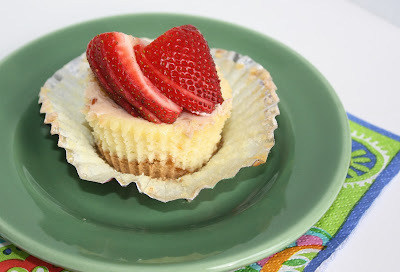 I was banana cupcaked out, and banana bread wasn't desserty enough, so I searched the Web for some ideas. 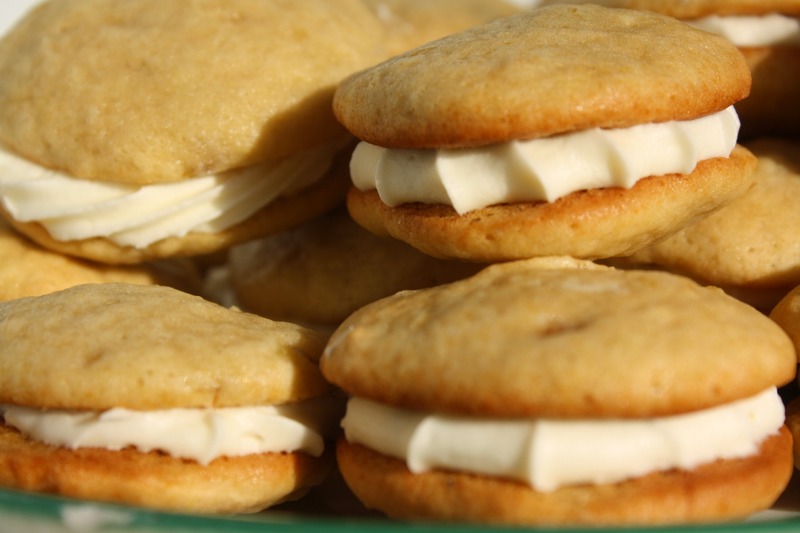 The recipes that caught my eye: Banana Whoopie Pies. Mmmm ... they sounded so good. But Banana Whoopie Pies for a church function? Wouldn't that sound a little risque? 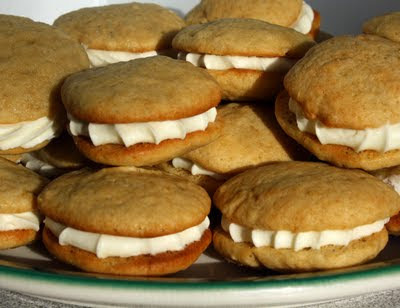 I had never made whoopie pies before, or even tasted them, but they sounded so good that I decided to risk it. Ohhh ... they turned out sooo good. Two cakey cookies that tasted like banana bread, sandwiched together with a generous dollop of fluffy, sweet, tangy cream cheese frosting. At the church dinner, I heard no complaints. Just a few "mmm's" and "oohs." I'll be making whoopie pies again for sure. In a large bowl, cream butter and sugars until light and fluffy. Beat in egg and vanilla. In a small bowl, combine banana and buttermilk. In a third bowl, combine the flour, salt, baking powder and baking soda; gradually add to creamed mixture alternately with banana mixture. Drop by tablespoonfuls two inches apart onto parchment paper-lined baking sheets. (At this size, you will make about 50 cookies.) Bake at 350° for 12-15 minutes or until set. Cool for 2 minutes before removing from pans to wire racks to cool completely. For filling, in a large bowl, beat the cream cheese, and butter until fluffy. Beat in confectioners’ sugar, vanilla and salt until smooth. Use a pastry bag with a large star top to pipe a generous dollop of filling on the bottoms of half of the cookies. Top with remaining cookies and press together gently. Refrigerate for at least an hour before serving; store in the refrigerator. Makes about 25 cookie sandwiches. My thoughtful mother-in-law is always telling me not to "fuss" when I'm planning a family gathering. Since I enjoy what she terms "fussing" -- making a nice meal and dessert -- I often don't heed her advice. But last week, when we celebrated her birthday, my hectic schedule made me give in. We called out for pizza and wings ... but I did manage to make a reasonably nice dessert. 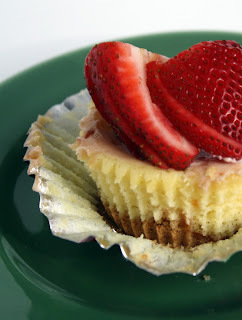 Since she likes cheesecake, I made these cheesecake cupcakes, which I adapted from a recipe from Family Circle magazine. I was happy with the way they turned otu -- they had a subtle orange flavor and were just a tad firmer than I usually prefer for cheesecake. My mother-in-law enjoyed the cupcakes, and also mentioned that she appreciated the portion control (as did I). They'd also be a good dessert to have for Easter. Speaking of which ... I won't be posting again until after Easter, so I'd like to wish my friends, family and readers who celebrate Easter a joyful day! Heat oven to 325 degrees. Line 12-13 muffin pan cups (or 12 muffin cups and a few minis) with foil cupcake liners. (Yes, you really need them to be foil -- but there are some cute and colorful foil liners out there.) Place 1 scant tablespoon of graham cracker crumbs in each -- just enough to coat the bottom. Beat cream cheese and sugar until smooth. Add eggs and beat until blended. (Be sure to keep scraping the bowl throughout the mixing process to keep the mixture smooth.) Beat in sour cream, juice, zest and vanilla. On low speed, beat in flour and salt. Spoon about 1/4 cup batter in each cup (I use an ice cream scoop). Bake at 325 for 35 minutes. While the cupcakes are baking, stir together the sour cream and jam. After 25 minutes, spread about 2 teaspoons of the sour cream mixture on top of each cupcake and bake for an additional 5 minutes. Remove from oven and cool in pan on wire rack for 30 minutes. Remove cupcakes to rack to cool completely. Slice strawberries without cutting all the way through the stem end (see picture). Fan out strawberries and place on top of cupcakes. 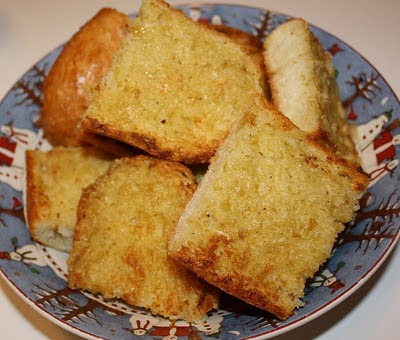 This bread, which I served with lasagna for my son's 16th birthday, is absolutely divine. As usual with Paula Deen's recipes, it had an obscene amount of butter, which I cut back by a fourth, and it was still decadent and delicious. It's definitely a repeater recipe, but to avoid a heart attack it's for special occasions only! Cut top off garlic head. Place garlic on a piece of aluminum foil; drizzle with olive oil. Fold edges together to seal. Bake 30 - 40 minutes. (To see if it's done, squeeze the sides while holding a kitchen towel, The garlic should give easily and feel soft). Cool. Squeeze cooked garlic into a medium bowl. Garlic will be soft and sticky. 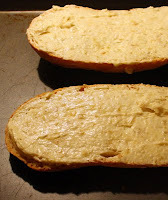 Add butter, salt and pepper, stirring to combine.Spread cut halves of bread evenly with garlic butter mixture. Broil 5 1/2 inches from heat, with oven door partially opened, for 2 to 3 minutes, or until butter melts and bread is toasted. Cut into slices to serve. My older son recently turned 16, and I'm starting to envision a time where he no longer lives at home. He'll decide for himself how much time he'd like to spend with his Mom -- and since I love the kid, I'd like to see him choose to spend some time with me. I figure that one way of ensuring this is by having recipes that I make the best (at least in his eyes). A meal I continue to tinker with is one of his favorites -- lasagna and garlic bread. I've made both fairly often and I usually cook them without a recipe. Because of this, they come out different every time, and very rarely a "wow.' The lasagna has a tendency to be dry and not flavorful enough, and the garlic bread ranges from not enough garlic to too much. My most recent attempt at the meal was from Paula Deen -- not because I think she's the greatest Italian cooking, but because her recipe is along the lines of how I usually make these dishes. In her lasagna, she uses a combination of ground beef and Italian sausage, which is what I usually do. I substituted 1/2 pound of turkey breast for ground beef in an attempt to lighten the dish a bit, which didn't do much to help the flavor or texture. She uses cottage cheese, which I changed to ricotta. She called for oven-ready noodles, but I use regular. The lasagna was good -- my son and husband ate quite a bit -- but wasn't exactly what I'd want my son to call "Mom's Lasagna." The meat overwhelmed the dish and made it really heavy. It's a good starting point, though. Next time I'll try it with less of the meat and see how that goes. 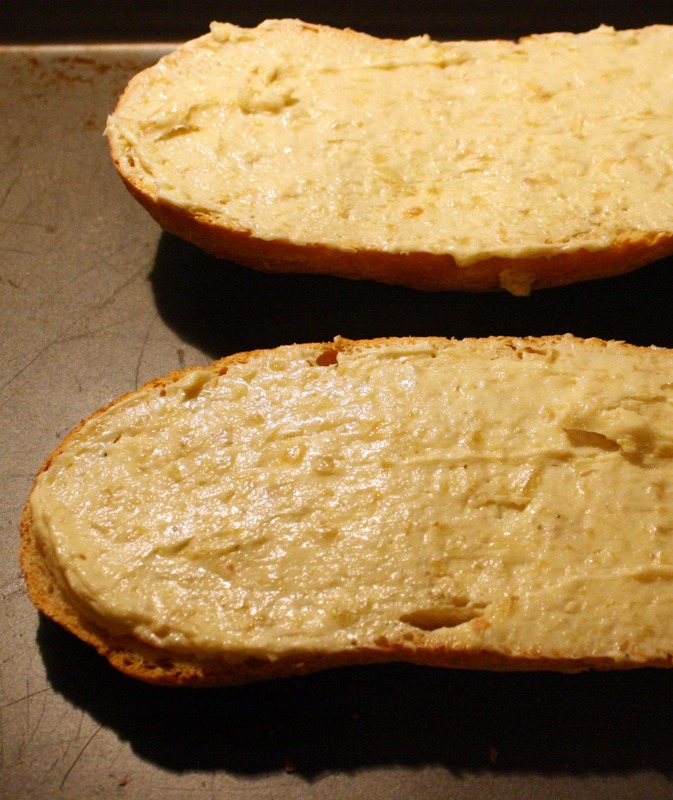 Next post: Paula's DIVINE garlic bread. In a small bowl, combine Ricotta, Parmesan, parsley, and eggs. Spoon 1/4 of sauce into bottom of a 13 by 9 by 2-inch baking pan. 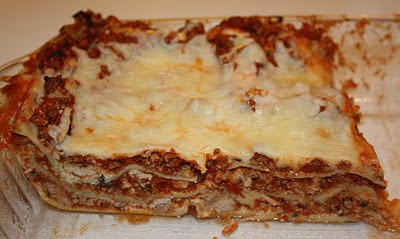 Place 3 uncooked lasagna noodles on top of sauce. Do not overlap noodles. Spread 1/3 of the Ricotta cheese mixture over noodles, top with 1/4 of sauce and 1/3 mozzarella cheese. Repeat layers, ending with sauce, reserving 1/3 of mozzarella cheese. Bake 45 minutes. Top with remaining cheese and bake 15 minutes or until hot and bubbly. Let rest 10 minutes before serving.